We had lunch at McMenamins Bagdad Theater and Pub yesterday. 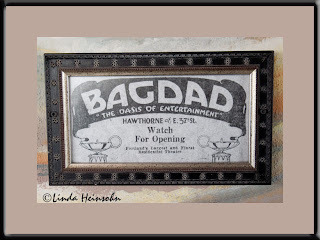 Universal Pictures built the Bagdad in SE Portland in the late 1920s for $100,000. It is now saved from demolition by the McMenamins and converted in 1991 into a movie house serving pizza and beer. They've actually added tables in front of each row of theater seats so you can eat and watch the movies simultaneously!